THE HEAD SALES COACH…Coaches understand if they want to win they can’t focus on the score. Instead they have to identify the causes that produce the score they want and get busy coaching and managing those causes. 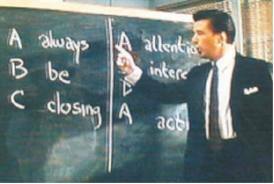 Sales leaders who coach, win, because the ABCs of Sales Leadership are Always, Be Coaching! Are you running a sales organization or managing salespeople? Are you an executive who needs to improve your com pany’s sales results? It’s fairly simple, even easy, to identify the sales you want or need to produce. However, sales are a result, and results can’t be managed anymore than the score can be managed. When you wait until the results are in, it’s too late. Increasing sales requires identifying the causes that produce sales and begin coaching and managing those causes. The first thing to acknowledge is that salespeople are performing artists. Just like athletes, actors and musicians they need direction, leadership and coaching to produce their results. Once you acknowledge this, you can begin to understand the importance and priority coaching plays in your organizations sales success. In fact, you’ll start to understand what’s missing in most sales organizations. THE SALES COACH! Here are some key areas and specifics you can get started implementing if you’re going to stop being a frustrated traditional sales manager and become a successful sales coach. PERFORMANCE CULTURE…Instilling an attitude that sales is a performance art will be a key to your success. Building a team of passionate salespeople who care about customers and helping people while being an advocate for the profession of sales will require the full force of your will. Turning mediocrity into excellence always does. You’ll need a firm belief that you are working to leave a legacy, not just working to produce sales numbers. The focus on making customers, instead of sales, can help make this possible by creating a higher purpose in your sales philosophy. I used to advise my clients to only hire people with a passion to be their best and an exceptional work ethic. This doesn’t work any longer because you won’t find enough people with these traits because we’ve experienced too much of a deterioration in what’s considered average. Our standards have eroded. You’ll need to be prepared to inspire and develop salespeople to learn grow and become peak performers. RECRUITING & TEAM BUILDING…Do you know your next salesperson? Do you have a bench, feeder system or know where to look for your next salesperson? A sales coach’s first action should be to recruit salespeople. This has three distinct purposes. First, performers should know if they don’t perform they can be replaced. This will help instill a performance culture in your sales team. Second, you need to find the people you believe you can coach, teach and train. Third, you want to hire differently than your competition to increase your chances of coaching a winning sales organization loaded with top talent. COACHING IS ADJUSTING ATTITUDES…Attitudes produce actions that generate results. Attitudes are dominant thoughts and beliefs that make up a person’s state-of-mind. Salespeople need a superior state-of-mind to improve their ability to perform at their peak consistently. Sales Coaches manage attitudes that creates the atmosphere or culture of their sales team. This requires personal contact daily with your salespeople to check their attitude. This will give you the time to support the people with positive attitudes, coach up the one’s who need it and make sure they are prepared to perform to their peak. TEACHING SKILLS & KNOWLEDGE…Sales Coaches are always teaching. They teach to improve the skills and knowledge of their salespeople. They train salespeople by holding them accountable to learn and improve. Training is what your salespeople do and it’s a Sales Coaches responsibility to insure their salespeople train to stay in sales shape. Being a teacher and trainer is an ongoing part of being a Sales Coach. So, Sales Coaches have to study, learn and grow constantly if they are going lead their team to success. Regularly scheduled sales education are a coaches responsibility. Creating a culture where change, learning and growth are a habit of all salespeople is the real requirement for sustained success. 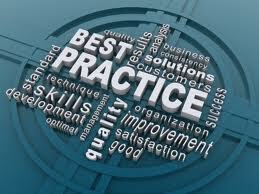 MANAGING & TRAINING ACTIONS…Managing actions is the exercise of assigning and monitoring the work of your salespeople. The salespeople who don’t want to improve won’t like being held accountable and they’ll often call this micro-management. It’s not micro-management, it’s responsible Sales Coaching. There are two distinct purposes for monitoring work. The first is accountability. The second, and most important, is to create real life opportunities to coach attitudes, teach skills and knowledge while assigning actions to be taken that you can monitor and do this all again. This is the circle of coaching, teaching, training and managing to coach teach and train that will produce the improved results you desire. These are the actions of successful coaches first taught to me by my father Charles Moore, a successful football coach, added to and reinforced by John Wooden in one-on-one sessions with me. They have been implemented, developed and constantly proven in real life environments during my career for over 38 years. In addition, I have been successfully coaching, teaching and training sales managers and executives using these for over 20 years. They are the skills that successful sales coaches master and practice daily. Peak performing sales management and coaching are often the missing link in a companies sales organization. Get started Coaching today and don’t let that be the case in your company. Selling is a journey and not a process or something to be done to or even for people. Selling must be done with people after a connection of trust and confidence is made. When selling is practiced as a process people resist or are reluctant to participate. The connection needed to help, serve and do what’s best for the buyer is lost or never made at all when you are trying to take them through your sales process. To be a successful salesperson you’ll need to sell with people, because selling is a journey…The buyer’s journey or their process. So, the first step in selling is being invited to be the buyer’s guide. To do this you’ll have to connect with them so they feel confident enough to invite you and that requires you to be a likable, trustworthy, expert. Most people admit that when they go shopping for anything that cost more than a few hundred dollars they’ve already decide to buy…They just want help confirming their decision and a better understanding of what to expect after they buy it. The Question…Why would the buyer invite you to be their guide on their journey or buying process? The Answer…Trust and aligned intentions, and they can be achieved by taking the next 7 steps. 1) Be mindful that they choose you to be their guide. It’s not up to you but their decision will be based on your attitude, actions and skills…’your behavior’. Most importantly, all of these are driven by your intentions. Once they do choose you, you’ll have to keep earning their trust and confidence by being a ‘good guide’ that puts their issues before yours. If your intention is to sell them, they won’t trust you enough to allow you to guide them. If your intention is to guide them to what’s best for them…they’ll allow you the privilege of being their guide. 3) When they aren’t moving with you, you have to reconnect…You reconnect by asking what’s wrong or where you got off course to uncover why you lost them and get back on their journey…Why are we not moving in the same direction? Remember it’s about serving people not trying to please them…It’s about their issues and next step, not yours. It’s about their reasons they are buying, not yours. 4) Remember, sometimes you aren’t the right guide for them but that should never be more than 15% to 20% of the time…80% to 85% of the people you have an opportunity to do business with can and will choose you as their guide if you make their ‘why’ they’ll buy, more important than yours (making a sale). Then you can find out if what you’re selling is best for them…the destination where they want to end their journey. 5) It’s imperative to understand you’ll only know their ‘why they’ll buy’ and be able to guide them if you stay connected, so they feel comfortable communicating openly and honestly with you and this happens when you align your intention with theirs…They won’t open up and share if they don’t trust your intentions. 6) Like any guide…it’s your job to safely guide them to the final destination they want. When it isn’t going that way, engage them as to why you aren’t in the same place but remember it’s not your job to choose the destination just guide them to theirs. Remind them you’re there to help them but it’s got to be more than words, it has to be your real intention to help, serve and do what’s best for them or they will feel your insincerity and disconnect. 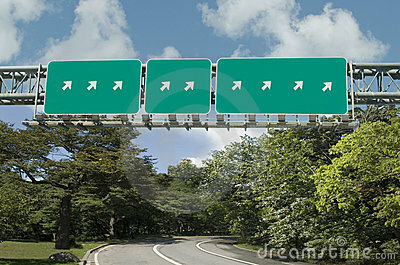 7) Keep moving in the same direction, stay at the same destination with them until they are ready to move. Buying isn’t always a smooth journey, as we all know, but if you keep coming back to their destination each time it feels like you aren’t connected, then you can help them reach their final destination more often. Make them a customer, not just a sale, and making customers will increase your sales. The traditional selling process, led by the intention to make a sale, damages the connection and communication between buyers and sellers. In fact, it creates what phycologists call retractance. It makes people shut down, pull back and avoid those trying to persuade them to buy their product or service. Selling happens when buyers connect with a salesperson and invite them to be their guide on their buying journey. The steps of a sale that have been traditionally taught, happen during a buying process, not a selling process. The steps are taken by the buyer when they’re served by a salesperson with the intention to help, serve and do what’s best for them. The salesperson’s intention is what was missed when salespeople learn to sell as a process. It’s what opens or closes the door to their communication with buyers. Selling, as most salespeople have learned it, is based on following a process which isn’t the most effective way to sell. It leaves the buyer’s participation out of the equation. Selling isn’t a process to be done to buyers, it’s much more effective to join the buyer in their buying process buy aligning your intentions with their. They want to be served, they want help and they want to do business with someone who wants to do what’s best for them, instead of just wanting to make a sale. Most sales processes are models of what top salespeople do, but what they do happens because they have the right intention. The right intention opens the connection and communication. This intention that holds so much power, is to help, serve and do what’s best for the buyer. 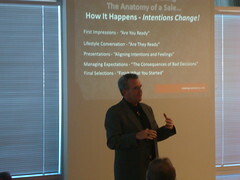 The missing link in the traditional sales process and training is the salesperson’s intention when they engage buyers. Intention is the greatest tool a salesperson has and it communicates so loudly that people don’t hear or believe most of what salespeople say. At least not until they feel their intention is to truly help them, even above making a sale. When salespeople understand selling is about the buyer not the seller, product or service, then they get invited to be the buyer’s guide and the steps of a sale happen naturally. The steps of a sale are more of a map or indicator, than a process. Traditional selling mapped those steps but left out what made them happen…the salesperson’s intention. The intention communicates with buyers and moves them to trust, open up and share with the salesperson. This results in more sales being made. People shopping want help. They just don’t believe they get it from salespeople today because their dominant intention is to make a sale. Companies and sales managers sabotage their salespeople by instilling in them the intention to make a sale when they engage a buyer. Ultimately, everyone loses! People aren’t wrong about salespeople. Salespeople will tell anyone who asks, that their main intention when talking to a buyer, is to make a sale. After they make a sale, their intention is to make another sale. People feel this and know that’s what salespeople are about today. Top salespeople figure out that selling is a service and customers are more valuable than sales. The right intention makes connecting with buyers happen and becomes the salesperson’s greatest selling tool! Buying a new home isn’t as much about real estate or an investment anymore as it is about the new homebuyer’s desire to enhance their lifestyle. So, the Design Center isn’t just about options and upgrades anymore! It’s about a Homebuilder’s transformation into a New Home Retailer who can meet the personalization desires and deliver the ‘New American Dream’ of living a luxury lifestyle. It’s about understanding today’s ‘new homebuyer’ and delivering the world class customer experience they deserve when making the most important purchase of their life! To do this a homebuilder must start with the customer experience first and work their way backwards. They must focus on the customer first and not the products or process, so they can make the product and process fit the experience instead of making the customer fit the process. Self-Awareness Issue #1…You are not a production builder…You build personalized homes on a schedule! Do you build production homes? No, you build personalized homes on a schedule, and until a homebuilder gets everyone in their business on this page they will continue to struggle. Homebuilders everywhere just wish options and upgrades would go away. Owners, executives, purchasing, construction, customer service and accounting people in the homebuilding industry struggle with this attitude and will continue to until they realize personalization is a core function of their business. After they acknowledge this is true, they can embrace the changes it causes to their jobs as a vital part of the business, instead of a hassle they wish would go away. Self-Awareness Issue #2…Most people in the homebuilding industry are ‘used’ homebuyers and do not think like a ‘new’ homebuyer. How many people in a position of leadership in the homebuilding industry would only shop for and buy a ‘new’ home i stead of a used home? Even if they buy a ‘new’ home they usually get to break all their companies rules for homebuyers to personalize it the way they want it…So, they aren’t really a ’new’ homebuyer, they are a new custom home buyer. I ask because the New Homebuilding Industry, is an industry led by and sold by predominantly ‘used’ homebuyers! Acknowledging this is a beginning that will allow you to start making the changes you’ll need to make to align with your intentions and mindset with the ‘new’ homebuyers who are your customers. Mindset Shift #1…The vast majority of ‘new’ homebuyers want to buy the latest greatest and want a finished home, not a fixer up or a remodeling project! They’re buying ‘new’ instead of ‘used’ for this reason. They’re dreaming of the lifestyle their ‘new’ home will allow them to live! Once a homebuilder experiences the first two self- awareness issues they can better understand the mind of a ‘new’ vs ‘used’ homebuyer. When this happens, and works it way through everyone at a homebuilder, then the homebuyer engagement and customer services will start to improve. There has been lots written and discussed about how Boomers, GenX and Millennial homebuyers are different, but I’ll tell you they’re more similarities than differences when they make the decision to be a ‘new’ homebuyer and not a ‘used’ homebuyer. As new homebuyers they’re more alike than different…It’s more about lifestyle, personalization and their finished home, than it is about their generational differences. Mindset Shift #2…Personalization is the most attractive thing about a ‘new’ home to the vast majority of ‘new’ homebuyers…So, it’s the most valuable thing you have to sell. Oh, and your standards aren’t fabulous or what a ‘new’ homebuyer wants in their home, and the vast majority don’t want to fix up their home after they move-in. Personalization and the Design Center experience is the greatest value added service to help a homebuilder sell more homes. Getting new home sales agents to embrace this and not be afraid of the money people will need to invest to personalize their home is vital to their success in selling more new homes today! New home salespeople who embrace and engage ‘new’ homebuyers with a respect and appreciation for the different between ‘used’ homebuyers and ‘new’ homebuyers will be the big winners going forward. Over 80% of ‘new’ homebuyers don’t want to buy a new home ‘fixer upper’ and are willing to invest to make their new home their own personal living space. Engaging ‘new homebuyers’ with this knowledge improves the communication, allows for accurate expectation and makes the experience of buying a new home more enjoyable. Mindset Shift #3…The Design Center isn’t about options and upgrades, it’s not about products, it’s about a personalized finished home. First, the Design Center experience is about helping homebuyers design a finished plan for their new home that reflects their personal taste and enhances their lifestyle. Second, the homebuyer will need your help staying focused on why they bought a ‘new’ home instead of a ‘used’ home. Yes, they buy for one reason and then sabotage their own happiness if they aren’t properly assisted and guided by a trained professional with the expertise to truly serve them. However, when this is done correctly, Design Center sales increase, homebuyer satisfaction soars and profits grow!!! 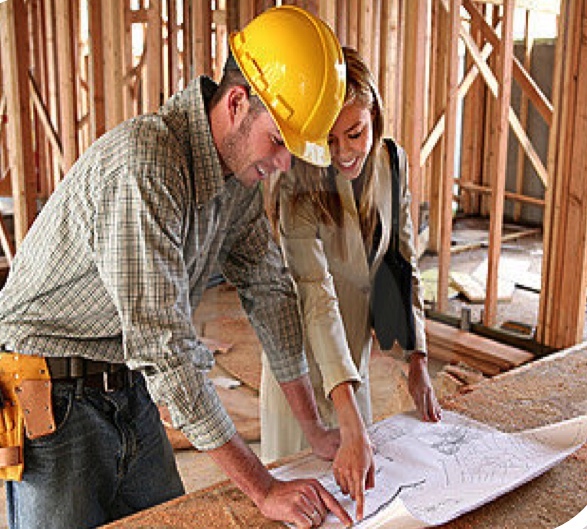 The proper customer engagement at the Design Center makes sure the homebuyer’s expectations match the reality of the home they are moving into, and assures they haven’t turned their new home into a new home ‘fixer upper’, unless they’re one of the few who truly wants a ‘new home fixer upper’! This can only happen when a builder takes the next steps to educate and training all their staff. Everyone must come to acknowledge the first two self-awareness issues and begin accepting the 3 mindsets so they can align their thinking and service to match that of the ‘new’ homebuyer. Then, they can all start working together to deliver the world class customer experience a ‘new’ homebuyer deserves as part of the most expense purchase of their life and a Homebuilder can become a New Home Retailer! If you want take the next steps in becoming a successful ‘New Home Retailer’ who delivers a world class customer experience, contact me for more information! Coaches understand if they want to win they can’t focus on the score. Instead they have to identify the causes that produce the score they want and get busy coaching and managing those causes. Are you running a sales organization or managing salespeople? Are you an executive who needs to improve your company’s sales results? It’s fairly simple, even easy, to identify the sales you want or need to produce. However, sales are a result, and results can’t be managed anymore than the score can be managed. When you wait until the results are in, it’s too late. Increasing sales requires identifying the causes that produce sales and begin coaching and managing those causes. Instilling an attitude that sales is a performance art will be a key to your success. Building a team of passionate salespeople who care about customers and helping people while being an advocate for the profession of sales will require the full force of your will. Turning mediocrity into excellence always does. You’ll need a firm belief that you are working to leave a legacy, not just working to produce sales numbers. The focus on making customers, instead of sales, can help make this possible by creating a higher purpose in your sales philosophy. I used to advise my clients to only hire people with a passion to be their best and an exceptional work ethic. This doesn’t work any longer because you won’t find enough people with these traits because we’ve experienced too much of a deterioration in what’s considered average. Our standards have eroded. You’ll need to be prepared to inspire and develop salespeople to learn grow and become peak performers. Do you know your next salesperson? Do you have a bench, feeder system or know where to look for your next salesperson? A sales coach’s first action should be to recruit salespeople. This has three distinct purposes. First, performers should know if they don’t perform they can be replaced. This will help instill a performance culture in your sales team. Second, you need to find the people you believe you can coach, teach and train. Third, you want to hire differently than your competition to increase your chances of coaching a winning sales organization loaded with top talent. Attitudes produce actions that generate results. 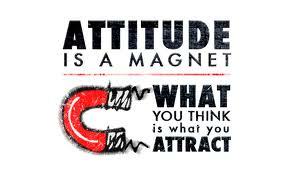 Attitudes are dominant thoughts and beliefs that make up a person’s state-of-mind. Salespeople need a superior state-of-mind to improve their ability to perform at their peak consistently. Sales Coaches manage attitudes that creates the atmosphere or culture of their sales team. This requires personal contact daily with your salespeople to check their attitude. This will give you the time to support the people with positive attitudes, coach up the one’s who need it and make sure they are prepared to perform to their peak. Sales Coaches are always teaching. They teach to improve the skills and knowledge of their salespeople. They train salespeople by holding them accountable to learn and improve. Training is what your salespeople do and it’s a Sales Coaches responsibility to insure their salespeople train to stay in sales shape. Being a teacher and trainer is an ongoing part of being a Sales Coach. So, Sales Coaches have to study, learn and grow constantly if they are going lead their team to success. Regularly scheduled sales education are a coaches responsibility. Creating a culture where change, learning and growth are a habit of all salespeople is the real requirement for sustained success. Managing actions is the exercise of assigning and monitoring the work of your salespeople. The salespeople who don’t want to improve won’t like being held accountable and they’ll often call this micro-management. It’s not micro-management, it’s responsible Sales Coaching. There are two distinct purposes for monitoring work. The first is accountability. The second, and most important, is to create real life opportunities to coach attitudes, teach skills and knowledge while assigning actions to be taken that you can monitor and do this all again. This is the circle of coaching, teaching, training and managing to coach teach and train that will produce the improved results you desire. Selling is something you need to do with people. Sales are a result, not the purpose of selling. Selling is a noble profession, a vocation really, when it is done with people, to help, serve and do what’s best for them. Selling is only perverted when the sale becomes the purpose or focal point and money becomes the aim. If you truly want to increase your sales, grow you business and make more money, you’ll begin to be a ‘servant on a mission’ to help people. Then, and only then, will you begin to connect and communicate with people. Because then, people will connect and communicate with you. The intention to make a sale and the pressure applied by businesses, sales managers and sales trainers to make sales the focal point, or intention of a sales engagement, has damaged the profession of selling by creating mistrust of, and contempt for, salespeople. The intention to make a sale, makes people retract from salespeople. In the end it sabotages the very result everyone wants…More sales, more customers and more money. When you become a ‘servant on a mission’ you also become an advocate for consumers and buyers. You become the trusted advisor who’ll be invited to lead and guide people on their buying journey. You’ll begin to make customers, not sales! Your business will grow and your results will amaze you when you let the sale be an outcome, a result of a higher purpose to help, serve and do what’s best for the buyer. When you engage people in a sales conversation with their interests as the focal point, not yours, they can feel it and you become different. Make no mistake, until you do this, you will look, sound and act like every other salesperson and your results will not change and your passion for the profession of sales will not grow or be fulfilled. Become the ‘servant on a mission’ and separate yourself from the pack so you’ll be invited to lead and guide the buyer on their buying journey. Great salespeople have always been servants who let the sales be a result of their service not the focus of their efforts. It’s A Matter Of Time. Don’t Waste It! It’s easy to let your mind begin to wonder as the clock ticks down to closing time. In fact, too many salespeople take the last 20 minutes of each day off. Oh, the doors are open but no one is home. When someone does come in, they aren’t given your full attention or best effort. Like athletes who take plays off by coasting during a game, this costs salespeople and their companies money and reputation which effects future sales. Sales is a numbers game all right, but not the numbers you’re thinking of. It’s a matter of time. It’s the numbers on the clock that count the most. When you take 20 minutes off mentally each day by not paying attention or giving your best effort, it adds up quickly. Twenty minutes per day equals 1 hour and 40 minutes each week. This adds up to over 2 weeks off per year. In reality, salespeople take entire days off if they aren’t coached up and mentally ready to perform. Lots of things can cause this. 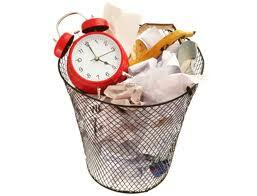 Personal distraction, personal problems and difficult customers who cause problems can all be excuses to take time off. These are all distractions that can cause salespeople to take time off even when the doors are open. Little bits of time add up over the months and years to sabotage your results. The reality is, it’s worse than just lost time. In a performance business like sales, it’s usually the last 5% of your effort that separates average performance from peak performance. It’s the consistent last little effort that produces the biggest results. So, 20 minutes per day or the 2 extra weeks off during the year costs you sales, customers, money, and the costs are multiplied because you are actually taking the last 5% of time off. If you don’t believe me, try working 5 minutes beyond closing each day. Don’t schedule personal appointments until at least 1 hour after your closing time and don’t take the 2 or 3 days off mentally before your vacation starts, just because you don’t want to start something you can’t finish. These are all excuses that make the numbers and time work against you as a salesperson. Successful salespeople have the self-discipline to not take the wrong time off. Top sales leaders understand that this makes salespeople produce average or below average results. They watch for this and teach salespeople the importance of leveraging their time and the power of the last 5% of their effort. 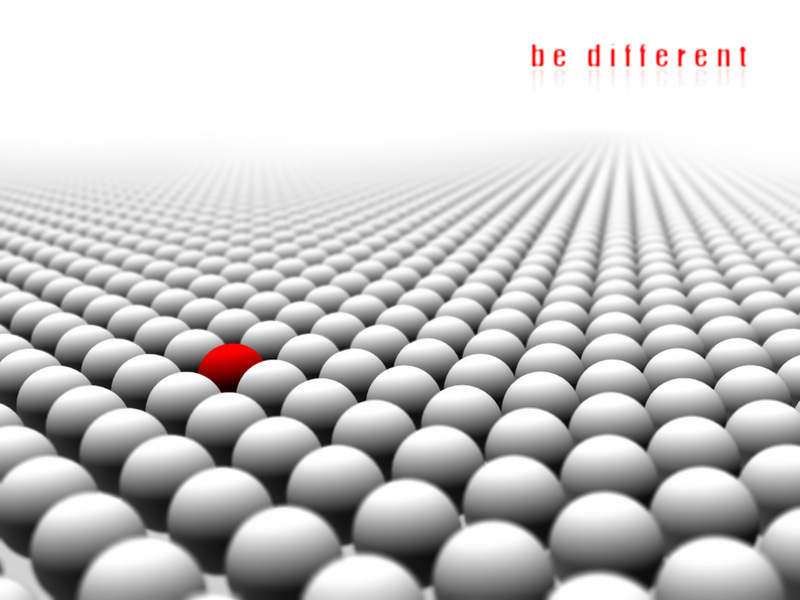 You need to be different to be successful. You have to stand out from the crowd to be seen and heard. You will only get noticed when you think different enough to act different and it often starts with what you measure as success. Changing what you measure will change your results. So, it’s time to stop measuring sales success in numbers and start measuring it in people…How many ‘customers’ do you make? Customers grow your business and insure your sustained success. Understand this, just because someone buys from you once, doesn’t make them a customer. At it’s best, selling isn’t about the buying experience, it’s about the ownership experience. Stop trying to ‘Wow’ buyers with a great buying experience and focus on ‘Wowing’ them with a great ownership experience…Make sure they enjoy owning your product or service. Then you’ll make customers, sales will increase and your business will grow exponentially. Making a customer takes caring enough to only do what’s best for the buyer, and never compromising this to make a sale. Then and only then will you reach your full potential as a salesperson and a business. When you are a buyer how do you want to be treated? What matters to you? What do you believe salespeople care about when they meet you or greet you? Can you tell when they are trying to sell you something? Does what they say, the way they say it or the words they use matter much if you know they are trying to sell you something? For years, salespeople have been taught what to say and how to say it as sales skills and sales techniques to increase sales. In sales seminars salespeople most often want to know what to say to handle objections and how to ask for an order that will increase their sales. Salespeople want to learn the steps and how to deliver or control the conversation so they can make a sale, then they want to repeat it over and over and hope it works on everyone. Look at the results teaching and selling this way have created. Buyers don’t trust salespeople and salespeople don’t believe buyers. Teaching sales this way also increased salespeople’s intentions to make a sale stronger and their ability to engage and therefore serve people weaker. All this has been while knowing sales needs to be a dialogue and salespeople need to build relationships to help people buy. Just think about the way this has been done…now keep reading. Now, think about how people really communicate. Most studies have found that as much as 93% of communication is non-verbal. Communication happens through all our senses and not just our hearing. In fact, most people’s weakest communication skill is listening. We can listen and take in input so much faster than people talk that most people are thinking and their thoughts are wondering while they should be listening. So the words we use are one of our weakest communication tools. Or is it? People are poor listeners and aren’t interested because they don’t believe the person talking cares about what they care about or don’t like and trust the person talking. So it is our misaligned intentions, our desire to convince them with what we say that weakens listening skills and makes people more interested in talking than listening. Non-verbal communication is more than body language. It is energy, conviction, confidence and many other emotions that deliver the real message behind the words. 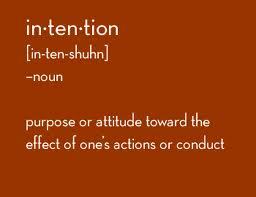 It is generated from your intentions, what you want to have happen or receive from the engagement or conversation. 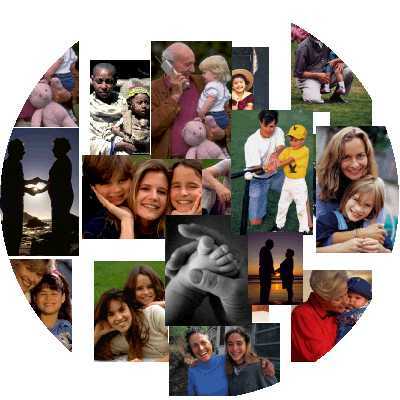 Making a real connection and creating a conversation where a relationship forms always starts from a connection made from non-verbal communication coming from our intentions. When two people engage each other they make many decisions about each other before a word is spoken. In fact, the studies have also found people decide if they like and trust someone within the first 8 to 40 seconds of meeting. This decision is made mostly through visual and sensory input that speaks to the brain stem and sends a gut feeling or intuitive sense and creates pre-conscious thoughts that allow or stifle open communication. When a positive connection is made between two people an open conversation can happen based on the preconscious decision to like and trust. This communication can lead to a positive fruitful relationship. If the preconscious thoughts are to not like or trust then a negative connection is made and a conversation may take place but it will not be open, honest or end in a fruitful relationship. These realities about how people communicate are the reason salespeople need to be less interested in the words they use or how to talk to someone in a sales conversation and more concerned about the pre-conscious communication coming from their intentions. If you are a salesperson, what are your intentions when you meet or greet someone in a business situation? What non-verbal communication are you sending? Should someone like you and trust you? Even if you are intent on uncovering their true needs and satisfying them, what is your real intention for doing that? If your intention is to sell someone, do you really expect them to like and trust you? If they don’t make that connection, are they likely to open up, share freely and allow you to find out what they really need or want? People only share their ‘why’ they want to buy with someone they believe intends to help them. Most of the sales skills taught and learned by salespeople over the years are valid and can help them serve people but they won’t be effective if the person they are selling doesn’t decide they like them and trust them enough to open up and communicate freely. 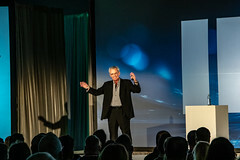 If selling is a dialogue and not a monologue then salespeople’s intentions have to change so a positive pre-conscious connection occurs and allows a dialogue or exchange of information to happen. The intention change needed to be liked and trusted enough to connect and communicate are the foundation of Making Customers™. The steps of a sale become destinations on the buyers journey and happen naturally when a salesperson’s intentions align with the buyers. Salespeople become servants on a mission to help people and customers are made, sales increase, business grows and selling becomes the noble profession of helping and serving people it was intended to be. To learn more about the intentions that make this happen and how to implement them, email me at mmoore@makingcustomers.com or call me at 858-354-2802. Many businesses have been losing money or experiencing shrinking profits for several years, reinvesting from their boom years and waiting for the economy to recover. If you’ve been focused on reducing costs, trying harder than ever to make more sales and waiting for this economy to recover, you’re in for a harsh awakening. If you’ve been saying, “We just need to hold on until the economy recovers”…Stop! You are suffering from normalcy bias. You believe because what you’re experiencing hasn’t happen before it can’t be happening, so if you can just dig in, hold on and wait for what has become your normal to return it will all be OK, you’ll make it. 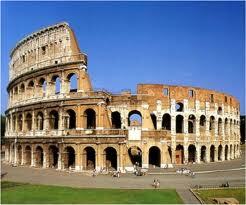 Every great civilization that has come to an end experienced these same conditions, emotions and challenges. Now it’s our turn, and since it’s a global economy it’s a global issue. It’s a business leadership crisis that has to be faced and won, not just to succeed in the ‘new economy’ but to exist. 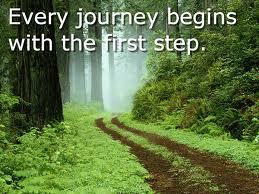 If the first step in recovery is acceptance, accept this…We are not in a recession, we are not in a downturn. We are in the GREAT TRANSITION to a ‘NEW ECONOMY’! Business will not be done successfully as it was in the past…things won’t just return to the good old days because they always have. The old economic models are broken beyond repair and that’s actually a good thing. The past economic model was too selfish, served too few and didn’t provide enough value to people. The past economic model broke too mant natural laws. It didn’t celebrated money as the end result, instead of as a means to serve people. It focused on maximizing profits by using people by manipulation and marketing campaigns instead of marketing the real value a company provided people. 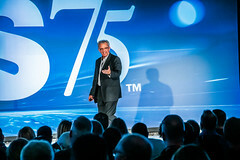 While most companies proclaim thier greatest asset is people, their people, both employees and consumers experience the effects of companies ‘profit first lesadership’ which focuses on new sales, not employee satisfaction and customer loyalty and in the end the relationship that builds a business has become so dysfunctional it ended the old economic model. Consumer and employee loyalty has diminished over the past 30 years until it’s non-existant and yet we see businesses trying to get back to the basics today…the same old tired basics that destroys trust, confidence and relationships betweens buyers and sellers. In addition since all employees are buyers too, they start with the sense that their company doesn’t care about them or their customers just making a profit. Add these poor business intentions to a maturing growing global economy, changing demographics and the real .com boom, or use of the internet to communicate and do commerce and you have the perfect economic storm. There is hope…Every storm brings with it a new dawn, a new day and opportunity to rebuild. The great news is there’s tremendous opportunity for businesses to separate themselves and become successful in the ‘new economy’ by becoming ‘customer first companies’. Focusing on making customers instead of making new sales and putting people before profits. This is the best way to increase sales, revenue, profits. Then a company can grow and prosper by continuing to provide real value to their employees and customers. To become a ‘customer first company’ and be successful in the ‘new economy’ requires ’employee first leadership’. This transition isn’t an easy one but it is the best and fastest solution if a business wants to succeed today! Business leadership is one thing America has stay out front of and been innovators and leaders in…Today we are faced with the decision to change or perish…Our business leadership must change to become ‘people first’ less selfish and more focused on creating real sustainable value by enriching people’s lives. Without this transition companies and the economy will continue to spiral downward and the growing gap between the have’s and have not’s will widen until it destroys the economy completely. It’s really a core capitalist point of view that’s been lost…If you want to succeed, you have to help others succeed, not just profit from them or use them. This isn’t just a business crisis either, what we now deem the ‘American Way of Life’ is doomed and we are destined to be the next great civilization that perishes if we don’t take action to make a successful transition by shifting to new business intentions. Businesses can no longer attempt to market a great story and then deliver an average buying and more importantly ownership experience. In the ‘new economy’ the most powerful marketing messages will written and spread by our customers and if their ownership experience is average your marketing message will be average, nonexistent or negative. If you truly put the ‘customer first’ you can market this and it will grow virally as a positive perfect storm. In 1954 Peter Drucker said, “The purpose of business was to create a customer.” This has never been more true, needed or obvious than it is today! It’s time to get real, be honest and become trustworthy! A successful ‘new economy’ demands that leaders and companies trust and respect employees and the consumer! I didn’t say, make them “always right”, which was foolish and didn’t work! That was part of the old selfish economic philosophy of making sales and then doing whatever the customer wants to make them happy…All that did was drive up the cost of doing business. Oh, and you can’t just rename your customer service department, customer retention or customer care…that won’t get it done because the consumer never gets over the first impression that you just wanmted to sell them something. It’s all just customer service after the sale and it didn’t make customers and it won’t make your ‘new economy’ successful. Companies have to be in this with the consumer to make them customers. Stop trying to sell to people and start doing business with people. This actually holds the consumer responsible as well and asks them to participate in their own satisfaction and loyalty. A successful company in the ‘new economy’ isn’t at war with the competition or the consumer but stays focused on finding their place of service and how best to enrich people lives by doing what’s best for their employees and customers. A successful ‘new economy’ will be built one customer at a time and must start by making them a customer, not a sale. Customer service starts at hello and is your consumers buying journey in the ‘new economy’! Customers are advocates for your business, they market your business, they are repeat buyers and they bring new customers to your business. Sales come and go, while customers stay and pay. If you want customers, then start with that in mind, make that the focus of your company. Stop try to sell people, it doesn’t work anyway! Start by trying to make people a customer and that starts by caring about your employees and putting people before profits to drive more profits to serve more people. You’ll increase sales immediately by making customers and you’ll make customers with new intentions to help, serve and to do what’s best for them…No I didn’t say whatever they want…That doesn’t work. In fact, it’s made things worse and added to the dysfunctional relationship between companies, salespeople and consumers that exists today. Filled and focused with new intentions, a new engagement and dialogue with consumers will happen that will create a healthy relationship and generate customers which increases sales. When you make customers, your employees will be motivated, your marketing message will be strong and your business will grow. This is the foundation for a successful ‘new economy’! What if I told you most salespeople are infected with a ‘sales repellent virus’ and this ‘virus’ has been handed out, usually unknowingly, for free, for years, by their companies, sales managers and sales trainers? Even more importantly, when a salesperson is left alone they catch this ‘sales repellent virus’ and even help spread it themselves. What if I told you when economic conditions get tougher the strength of the ‘sales repellent virus’ increases and more is handed out? Most people in the profession of sales think…’Not me, I’m couldn’t be infected with this virus’…but this virus has been growing for several decades and if it isn’t treated with the ‘sales attraction potion’ it will eventually make salespeople extinct. 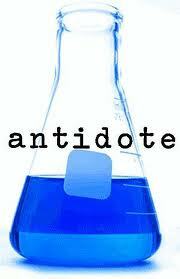 What if you became aware that there was an antidote, a ‘sales attraction potion’ you could take to prepare yourself to meet people when you’re selling. This ‘potion’, when taken, allows a person to relax, open up and engage a salesperson. In short, it attracts people to salespeople and allows them to connect. When this connection happens, the opportunity for real dialogue and conversation is possible. This connection allows the engagement and dialogue that sales managers, salespeople and sales trainers have been trying to make happen for years. This ‘potion’ and the connection it allows to happen, is necessary if consumers are to get what they want and enable a business is to grow. What if I told you this ‘potion’ has been around for years and really works? You’d be first in line. “Sign me up”, and “Where do I get more?” are the most common responses. The cynical salesperson wants to know how much it costs. What if I told you it’s free and the supply is unlimited? Well, guess what, it’s real, you can take it all the time and it will not only increase your sales, it will change your life. Remember, the supply of ‘sales attraction potion’ is unlimited and free! However, even when you know what it is and how to use it, you’ll have to take it every day and you’ll have to keep taking it every time you engage someone in a sales conversation. In short, the ‘sales attraction potion’ is simple to use but wear off easily because other people will be trying to give you the ‘sales repellent virus’. This usually happens unknowingly and if you aren’t careful it’s easy to catch this virus! By now, I know you’re ready for the active ingredient…The ingredient that causes the ‘potion’ to attract and the ‘virus’ to repel, is a salespersons’ intention when engaging consumers. Before a salesperson opens their mouth to speak, their intentions are felt (like the scent of a potion) by the consumer. The consumer then decides unknowingly, preconscious, to connect or avoid the salesperson. The salesperson’s intentions create their demeanor, presence and attitudes and cannot be faked. What the consumer feels or reads is the genuine intention from the salesperson. The effects of the active ingredient in the ‘virus’ the salesperson has is evident when consumers avoid talking to or opening up even when salespeople ask good questions and genuinely cares about the people they are trying to sell but is infected with the ‘virus’. 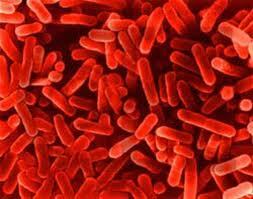 ‘Trying to sell’ is the active ingredient in the ‘sales repellent virus’. The ‘virus’ even sabotages skilled salespeople who believe in their product and company, care about the consumer, but unknowingly are infected! Even they will repel people more often than they attract them. You can’t hide the virus from people…it is always showing! The best example of the effects of the ‘sales repellent virus’ or intention to sell, can be witnessed in a new home sales office when watching the interaction between consumers and salespeople. If there is a salesperson and a temp in the sales office and a consumer comes in, they will most often engage the temp and avoid speaking to the salesperson. I’ve personally witnessed this and over the years had many new home salespeople confirm this behavior by consumers. It’s amazingly interesting that the consumer is attracted by the ‘sales attraction potion’ the temp has taken or repelled by the ‘virus’ salesperson is infected with. The consumer will engage the person that is not infected with the ‘virus’ that contains the intention ‘to sell them something’. Most companies, sales managers and sales trainers want salespeople to say the right things to create a better conversation with consumers. They want and teach salespeople to ask better questions and be better listeners. The problem is, when salespeople try to do this, while infected with the ‘sales repellent virus’, consumers won’t engage them and the engagement or conversation stalls. As long as a salesperson is infected with the ‘virus’, sales will continue to be difficult and the relationship between consumers and salespeople will grow more dysfunctional. In short, people will keep avoiding salespeople until they become extinct. The active ingredient in the ‘sales attraction potion’ is the intention to help, serve and do what’s best for the consumer. The intention to make customers, not sales, is the missing ingredient and cannot co-exist with the intention to sell. In fact, I’m convinced the intention to sell is the spoiled version of the intention to make a customer. The ‘virus’ wasn’t and never has been anyone intention to spread. It just mutated over the years from paying to much attention to the desired results companies, sales managers, salespeople and sales trainers wanted to create, instead of paying attention to what would create the results. Too much concern over what we want and not enough concern over what customers want. It’s also obvious that in a difficult economy we spend more time worrying and obsessing over the numbers and less time concerned about the customers concerns so the effects of the ‘virus’ worsen and spread. When the ‘sales attraction potion’ is taken, the missing link in the sales conversation happens…a connection between the salesperson and the consumer. This connection causes or allows a conversation or real dialogue to take place so a healthy relationship can begin. This is the power of the ‘sales attraction potion’; it makes the consumer/salesperson connection happen and allows the other ingredients in the ‘sales potion’ to be used to best serve the consumer. The steps of a sale, which have been taught for many years in various forms, only happen when this connection is made. Consumers only engage salespeople who have taken the ‘sales attraction potion’. When the connection is made, people are served, customers are made and sales increase while business grows. After taking the ‘sales attraction potion’, salespeople are free to enjoy the profession of selling as the noble profession of service it was intended to be. Whether you have taken the ‘potion’ and whether companies encourage their salespeople to take the ‘potion’ will determine your sales success! Keep handing out the ‘virus’ and you will keep struggling to make customers.